I've had this photinia for about three trouble free years. Can anyone tell me why the leaves are now getting these blotchy red/ maroon markings on them? It's planted in a reaonably moist,shady spot in clay. http://www.ext.vt.edu/pubs/plantdiseasefs/450-609/450-609.html see if this helps!Difficult to see on your photo,but it may be a match? 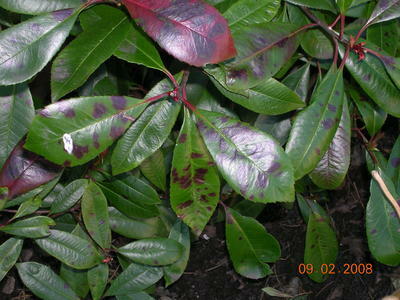 My photinia has sustained black/brown patches during the winter from frost damage. This might be different from your problem, difficult to tell. Thanks,Darryluk, Chrispook. I tracked the site down and the problem does seem to resemble entomo leaf spot. But the site also put me onto other links including the R. H. S. A member there asked a similar question and both leaf spot and winter frost and wind/rain damage were suggested as possible culprits. I reckon I'll sit tight for a while and see how it goes. Thanks again for your help, I'll keep you posted. When I went to our local Nursery on Saturday i noticed that their Photinias had the same problem - they wouldn't be selling them if it were a major problem, they are a reputable outfit. Could your photinia be growing on heavy clay? If so, this might be the problem because heavy clays are notoriously not well drained and photinia prefers a soil that has good drainage. Just a thought.